The DIH series field indicators are 4 ... 20 mA current loop indicators which can, in addition, offer a superimposed HART® communication between the connected transmitter and the control room. Thus the indication range and units are automatically adopted dependent on the settings of the connected HART® transmitter. Common units for temperature and pressure are already saved ex works. An additional “User unit” can be programmed optionally. 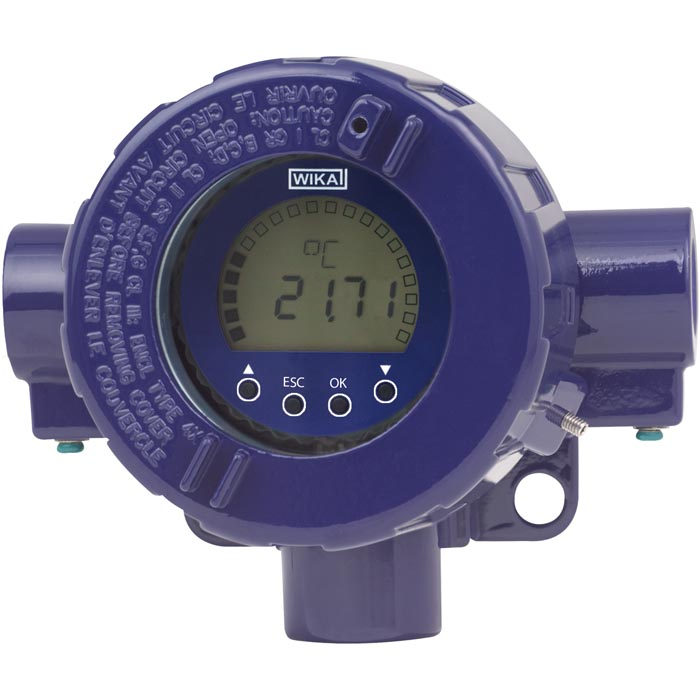 With this field indicator it is possible to display range alarms as well as MIN and MAX values. Error-current signals from the connected transmitters are also detected and displayed. The indicator can be used in conjunction with any 4 ... 20 mA transmitter. The field indicators are powered directly from the 4 ... 20 mA current loop, with a resultant voltage drop of less than 3 V.
The field indicators can be mounted directly onto a wall. An optional pipe mounting kit is available for fitting to pipes with a diameter of 1 ... 2". The models DIH5x-B, DIH5x-Z basic modules are also available separately for mounting into other suitable cases. The field indicators consist of an aluminium or stainless steel field case with a built-in display module.